Happy Mother's Day to all the Moms out there. Today I have a wonderful giveaway for our US/CAN followers thanks to Media Muscle and Book Trib. Check out this historical fiction and be sure to enter to win a copy! A vivid novel of Charles Baudelaire and his lover Jeanne Duval, the Haitian cabaret singer who inspired his most famous and controversial poems, set in nineteenth-century Paris. For readers who have been drawn to The Paris Wife, Black Venus captures the artistic scene in the great French city decades earlier, when the likes of Dumas and Balzac argued literature in the cafes of the Left Bank. Among the bohemians, the young Charles Baudelaire stood out—dressed impeccably thanks to an inheritance that was quickly vanishing. Still at work on the poems that he hoped would make his name, he spent his nights enjoying the alcohol, opium, and women who filled the seedy streets of the city. One woman would catch his eye—a beautiful Haitian cabaret singer named Jeanne Duval. Their lives would remain forever intertwined thereafter, and their romance would inspire his most infamous poems—leading to the banning of his masterwork, Les Fleurs du Mal, and a scandalous public trial for obscenity. 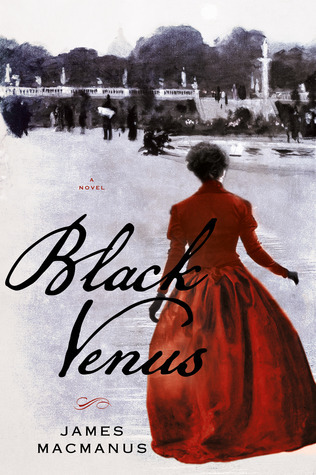 James MacManus's Black Venus re-creates the classic Parisian literary world in vivid detail, complete with not just an affecting portrait of the famous poet but also his often misunderstood, much-maligned muse. In its own sweet and secret speech. Lies bathed in warmth and evening light. I hope you had a fabulous Mom's day Kim!!! This sounds fantastic! Thanks for sharing :) I love Historical fiction b/c you really feel like you're there, right in the middle of real events. Thanks Diamond, good luck to you, it does sound pretty dang amazing! I really like historical fiction because you get a good story with (sometimes) accurate history portrayals or facts. I do too, good luck! I just enjoy reading about another time. Thanks for having the giveaway. So do I Rose, you can go anywhere from the comfort of your favorite reading spot, good luck! This sounds interesting! I studied French in college and loved translating exercises with Baudelaire's poetry. So gorgeous! I speak French but obviously in the US it is a bit hard to come by easily so I was thrilled to see Beaudelaire's peotry in French! Now I am interested in the book! Very clever posting! ;) Thanks Kimba! thank you, I didn't have an excerpt and came up with this idea! I have a copy of this one for review. I hope to get to it soon! Ha..we cover whores need to be careful, this sounds really good! So sorry! Some how I completely missed this post yesterday! Thanks for the giveaway, I love the cover on this! I hope you had a nice weekend and Mother's Day! You are too cute, and this posted late afternoon..good luck! Thanks Deb and same to you! I have to read this! It's totally my kind of book Paris, scandal and poetry, yum! It's gone straight on to my wish list. Wish I could enter! aww, i am so sorry..i wish I could afford to ship overseas.